McKee's 37 Anti-Frost Windshield Coating Kit #1 Best Seller During Winter! 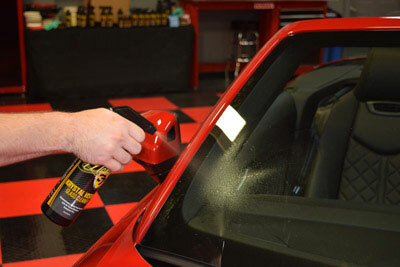 Keep your windshield clean, no matter the weather! The McKee's 37 Anti-Frost Windshield Coating Kit has all the essential products you need to keep your windshield clear, year round. This carefully assembled kit contains McKee’s 37 High Performance Glass Restorer to polish away imperfections on glass and McKee’s 37 Glass Coating to lockout contaminants. Once your windshield is restored and coated, keep it clean with a combination of Krystal Vision Glass Cleaner and Anti-Frost Windshield Washer Fluid. The Anri-Frost was specifically formulated to prevent frost i cold climates, but works great as a year round additive to your windshield washer reservoir. The McKee's 37 Anti-Frost Windshield Coating Kit truly has everything your glass need for year round cleaning and protection! McKee’s 37 High Performance Glass Restorer, 16 oz. McKee’s 37 Glass Coating, 4 oz. McKee’s 37 Krystal Vision Glass Cleaner, 16 oz. McKee's 37 Krystal Vision Glass Cleaner is a superior auto glass cleaner. It comes out of the sprayer like water. There’s no foam and there’s absolutely no harsh smell. As you wipe over the glass the film, the smudges and spots start to disappear. McKee's 37 Krystal Vision Glass Cleaner leaves glass -- even tinted glass -- clean and clear. Use with a Waffle Weave Glass Towel for streak and haze-free cleaning! McKee’s 37 Anti-Frost Windshield Washer Fluid, 32 oz. The Waffle Weave Glass Towel makes achieving streak-free glass easier than ever before. The waffle weave design allows this towel to absorb up to seven times its weight in liquid, which means all the glass cleaner you spray onto glass is absorbed - along with any dirt and grime - and pulled away from the glass leaving it smudge, streak, and smear free! The Waffle Weave Glass Towel is composed of 80% polyester and 20% polyamide for a perfectly soft and lint free towel. A total retail value of $100.95, Save $30.96!